Webbed toes, also known as syndactyly, are actually fairly common: About one in every 2,000 to 3,000 people has this condition. If your baby has webbed toes, you might not even notice until the first time you put socks on her tiny feet. 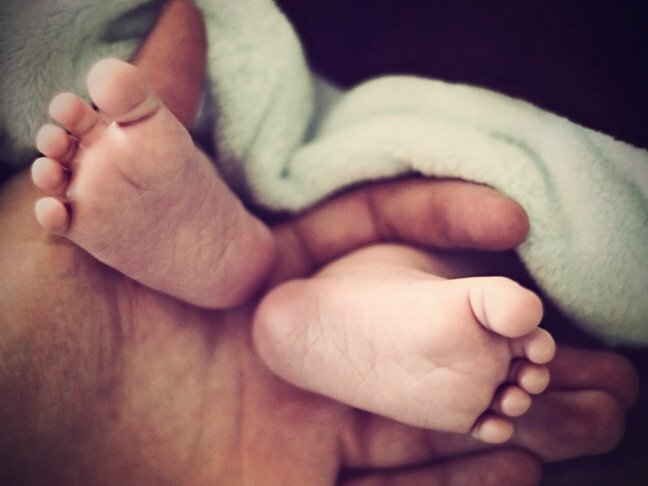 What does it mean if your baby’s toes are webbed? Keep reading to find out. Syndactyly, a condition in which two or more toes or fingers are joined, is taken from the Greek for “fingers together,” and is most common in Caucasian males. Webbed digits can be joined by skin alone, or the bones can be fused together either entirely or partially. Most people believe that webbed digits are entirely caused by genes, but that’s not exactly the case. Sometimes, the condition can be genetic or environmental, and other times it can be a small part of a larger syndrome like Down’s. We do know that during pregnancy, babies’ hands and feet start off looking like tiny Ping-Pong paddles, but around the sixth week, the baby’s digits begin to separate. In the case of babies with syndactyly, that process isn’t entirely completed. Can webbed feet be corrected? Your pediatrician is the best person to answer this, but yes, webbed digits can be corrected. However, it may not even be necessary. Despite parents’ understandable concerns, it’s usually not a problem for children learning to balance or walk. Also, you’d think separation would be simple, but it’s not because separation surgery requires skin grafts. You may want to wait until the child can give their opinion about their own feet. When you think your child might be teased, it’s natural to worry, but maybe you don’t have to. Some kids don’t care. Other kids think it’s awesome to have cool feet that are unique. For some athletic kids, syndactyly might even provide a competitive edge. Is syndactyly a sign of autism? This condition is not a sign of autism by itself. Both are features of a rare condition called Timothy syndrome, but this syndrome involves serious heartbeat irregularities and profound facial differences as well. Think of it this way: A cough can be associated with a serious illness, but that doesn’t mean a cough is always a sign of serious illness unless other symptoms are present. Remember, webbed toes are pretty common, and for the most part, they aren’t a major issue. How to Identify Your Baby’s BirthmarkDo You Know Your Baby’s MMR Vaccine Schedule?